This was Tottenham’s fifth fixture in 15 days and for over an hour there appeared to be little sign of fatigue from Pochettino’s side as they overcame the early loss of Moussa Dembele to injury to sail into a 3-0 lead. Belgium midfielder Dembele’s 250th Spurs appearance lasted a little over one minute before he suffered what appeared to be an ankle injury after Helder Costa fell into him following a challenge by Ben Davies. Spurs were already without Dele Alli – one of several players rested before Tuesday’s must-win Champions League Group B home game with PSV Eindhoven. However, there was a real menace about the visitors as Kane forced a decent save from Patricio before an unmarked Lamela opened the scoring after finding space inside the penalty area. Two minutes and 54 seconds later it was 2-0 after Moura was left unmarked to head home before Kane increased the lead after reacting first when Patricio kept out his original attempt. But Foyth’s late mistakes made for an unnecessarily nervy finish. Handed a start in place of the rested Davinson Sanchez, the Argentine clearly fouled Jiminez before pushing Wolves defender Jonny 10 minutes later, becoming the first player to give away two penalties in the same Premier League game since Phil Jagielka in 2016. Hugo Lloris dived the wrong way for both penalties but Tottenham held on to secure a sixth top-flight win in seven attempts away from Wembley. Wolves have settled quickly into life in the Premier League following promotion. But having gone on a six-match unbeaten run, they have now lost to Watford, Brighton and Tottenham. It does not get any easier for Nuno Espirito Santo’s side, with a visit to Arsenal – unbeaten in 14 league and cup games – up next. Despite a second successive Molineux defeat, there were positives. Wolves showed in their battling second-half performance that they have character, and they have every right to feel aggrieved at the officials after Jimenez’s celebrations in the 37th minute was wrongly cut short by an offside flag. Jimenez, Willy Boly and Neves all went close in a three-minute spell at the start of the second-half – Lloris producing a stunning stop to keep out the latter. 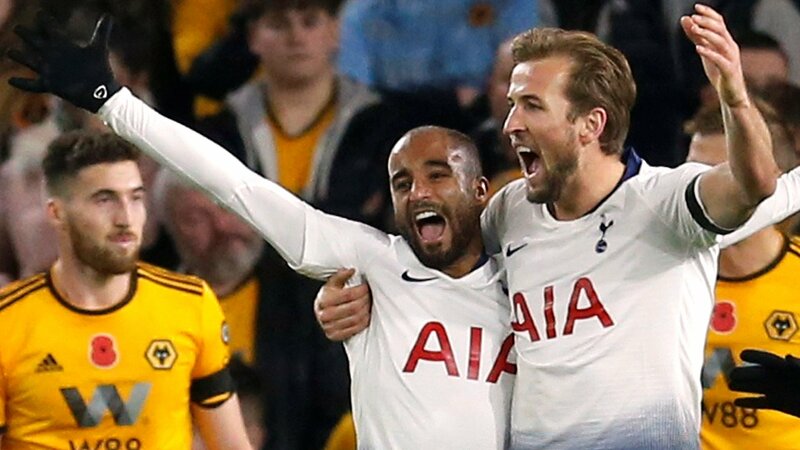 However, Wolves’ marking – particularly for the first two Spurs goals – was naive and it will have to improve if they are to stay away from the relegation zone. They have already proved they can hold their own against the heavyweights of the division by holding both Manchester City and Manchester United to 1-1 draws. With matches against Arsenal (away), Chelsea (home) and Liverpool (home) coming up in the next few weeks, Wolves cannot afford to gift the opposition two-goal starts.